Dr. Ashraf Imam (MAE) has published the second part of a paper he co-authored with his colleague, Francis H. “Sam” Froes: F. H. Froes and A. Imam. “Titanium: A Historic and Current Perspective—Part II,” Advanced Materials & Processes, April 2018. The paper was published in two parts, with the first part included in the journal’s February/March 2018 issue. On April 24, Dr. Lorena Barba (MAE) presented at the Open Education Global Conference of the Open Education Consortium. Her talk was titled “A Qualitative Study of Open Educational Practice using Jupyter Notebooks,” and it looked at students’ attitudes towards sharing and openness after experiencing a course that infuses culture from open source software. Slides of her presentation are available on Figshare. On April 19, Dr. Rachael Jonassen (director, EMSE Greenhouse Gas Management Program) presented an Earth Day talk for the 1,600 residents of Greenspring Village in Springfield, VA in the Village Square Theater. Her topic was “Climate Change: What We Learn from the Past.” This talk was part of her service as a speaker for the “Climate Voices” program operated by the National Center for Atmospheric Research and the United Nations Foundation. Dr. Taeyoung Lee (MAE) was invited to the Department of Aerospace and Ocean Engineering at Virginia Tech, where he gave the talk “Geometric Control on Nonlinear Manifolds for Complex Aerospace Systems” on April 23. Dr. Guru Venkataramani (ECE) has been invited to serve as an associate editor on the editorial board of the Springer Journal of Hardware and Systems Security. The journal covers the rapidly growing field of electronic hardware and systems security and highlights new and ground-breaking developments in this field, including cyber-physical systems, IoT, side channels, and hardware trojans. Currently, this is the only journal exclusively dedicated to hardware security. 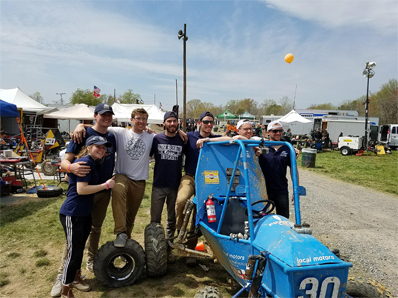 SEAS congratulates the members of the GW Mini-Baja Team: Andrew Edzenga, Delon Etzel, Conor Gillespie, Ari Haven, Nicholas Lechner, Joe Signorelli, and Peter Walsh, all of MAE. The GW team competed against 94 other teams in this year’s regional Baja competition and ranked 26th in the suspension test. The competition was held April 19-22 in Mechanicsville, MD. Dr. Murray Snyder (MAE) is the team’s faculty advisor. Dr. David Bray, the executive director of People-Centered Internet coalition and chief strategy officer of MapLarge, kicked off the CVP Speaker Series @ GW on April 25 with his lecture “Needed Now More Than Ever: Positive #ChangeAgents Across Sectors.” Dr. Bray discussed the implications of tech innovation, focusing on how human beings adapt to these changes. In our era of accelerating change, Dr. Bray discussed the need for pluralism, diversity of ideas, and “positive change agents.” The CVP Speaker Series @ GW was conceived by Mr. Anirudh Kulkarni, B.S. ’86, M.S. 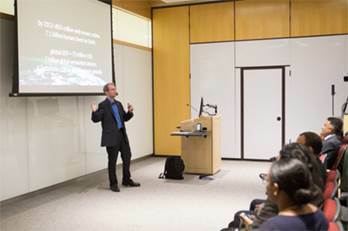 ’88, the CEO of CVP and a SEAS alumnus who committed the company to a public speaker series to address the impact of technology on change. Dr. Bray’s recorded talk is available on YouTube. Join Dean Dolling as he honors the winners of the 2018 SEAS Teaching and Research Awards: Dr. Igor Efimov (BME), Dr. Leila Farhadi (CEE), Dr. Ekundayo Shittu (EMSE), Dr. Danmeng Shuai (CEE), and Dr. Jason Zara (BME). SEAS Innovation Challenge Showcase: ¡Viva Puerto Rico! ¡Viva Puerto Rico! will showcase this year’s Innovation Challenge finalists and celebrate Puerto Ricans’ resiliency in the face of a prolonged post hurricane recovery. The 2018 SEAS Innovation Challenge is a technical competition designed to support disaster relief in Puerto Rico in the areas of off-grid power and communications. ¡Viva Puerto Rico! also will include a short documentary film screening, panels, food, and music to accompany the showcase of the finalists. At Jupyter Pop-up, find out how teams of data scientists, business analysts, and researchers use the Notebook and other Jupyter tools to solve “last mile” issues of communicating data to management, create self-documenting and future-friendly apps and widgets, and streamline your workflow. Featured speakers include: Paco Nathan, Lorena Barba (MAE), Peter Parente, Catherine Ordun, Dave Stuart, and Laura Noren. Receive an E-Team grant and get training through our early-stage innovator training program. The training provides peer networking, expert coaching, national recognition, and hands-on workshops to move your innovation forward. Applications are due May 2 and October 3.